Dr. Daniel J. Vujnovich, (aka “Dr. V” or “Dr. Dan”) Clinical Psychologist, has been providing Psychological services on the Gulf Coast for over 25 years. He is originally from Chicago Illinois and, despite growing up in the city, much prefers the country and lives on a working farm. After graduating High School he joined the U.S. Navy and served seven years as a Hospital Corpsman. Following his service in the Navy Dr. Vujnovich attended the University of Southern Mississippi and earned a Bachelor of Arts Degree with a Major in Psychology. A Masters Degree and a Doctorate (Ph.D.) were subsequently earned at the San Diego Campus of the California School of Professional Psychology. As he completed his Internship at the MS Gulf Coast Veterans Administration Hospital, Dr. Vujnovich set up a Private Practice of Psychology in Biloxi in 1987. Having pursued a specialty in Neuropsychology during his training Dr. Vujnovich has enjoyed a diverse practice experience providing Clinical Psychology and Neuropsychological services to coast residents, of all ages, in Mississippi. In addition to office consults Dr. Vujnovich has, over the years, consulted in numerous other venues including Head Start, Job Corps, Rehabilitation Programs, Hospitals, Nursing Facilities, Memorial Neurosciences and at the Armed Forces Retirement Home in Gulfport, MS.
As he continues to prefer country life Dr. Vujnovich, along with his family, lives on a farm. 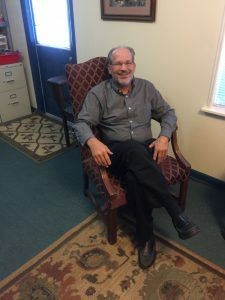 Now that his two sons are grown Dr. Vujnovich especially enjoys time spent with his wife, Dr. Elizabeth Koch, who is also a Clinical Psychologist and shares office space at their Biloxi Office. Farming, Hunting, Fishing and Music pursuits comprise a majority of his leisure time. Dr. Vujnovich has consistently reserved time for Civic and Volunteer activities having donated time, professional services and farm produce to numerous Gulf Coast charitable organizations over the years.